After a wash of 502 Abteilung Starship Filth had dried, I moved on to discoloring individual panels. To accomplish that, I used 502 Abteilung Faded Grey, Faded Navy Blue, and Faded UN White to pick out random panels along the craft. Since this is Lord Vader's personal starfighter, I figured it has seen a lot of action in his hunting of the Jedi and subsequent offensives against the Rebellion, so it isn't unreasonable to think that the craft has been damaged and required repair. The canopy had been given a bath in Future and is now dry, the next step is to mask the windows and paint the frame. After that is complete, the entire model will get a coat of matte varnish and I can then mask and paint the panels in the wings. 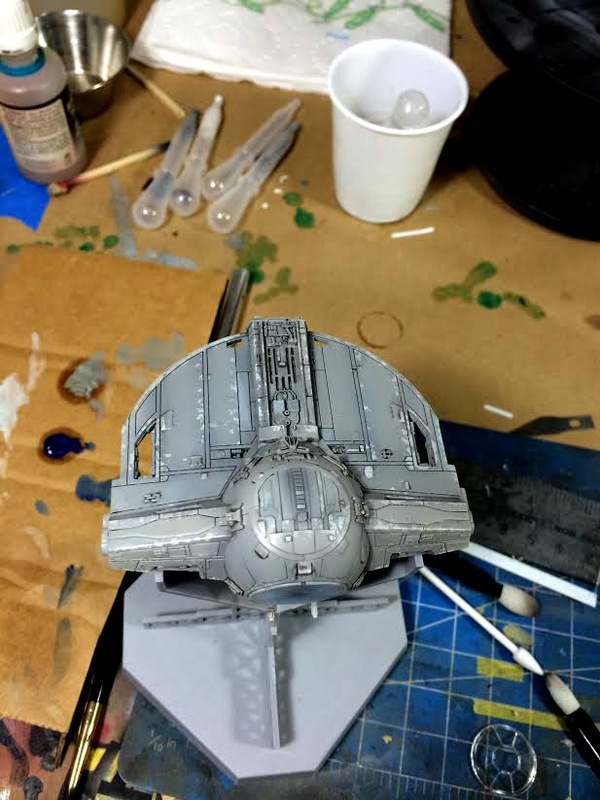 I sanded the "Star Wars" logo off of the base to accommodate a larger Imperial cog than I did on the TIE/Ln base. The added benefit is that the cog will be centered on the base which should give everything a much cleaner presentation.